If you are looking for a no-drug, no-alcohol hostel in Amsterdam, Shelter Jordaan is your place. This budget-friendly hostel is ideal for lone women travelers. Its location is perfect; right in the centre of Amsterdam in the Jordaan neighbourhood, famous for its trendy bars and funky boutiques. Shelter Jordaan is the perfect place if you are looking for a budget place to stay in Amsterdam. It is cheap and has everything you need. Furthermore, it is at walking distance from Central Station, Anne Frank House and Albert Heijn Supermarket are round the corner. 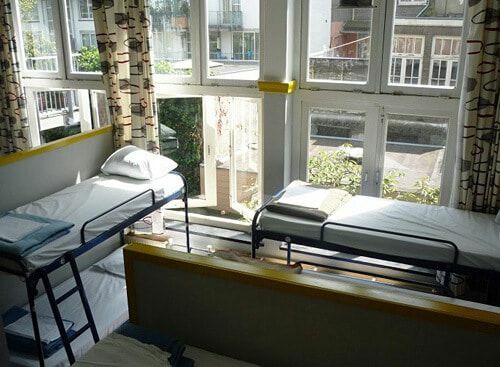 The hostel contains just over 100 beds in dorm-style rooms with 4 to 18 beds with shared facilities. The larger dorms have dividing walls between the beds to safeguard privacy. There is a separate floor for women and men. Breakfast is included in the dorm price. The big bonus is the café that serves dead-cheap meals all home-cooked. The garden is the place to hang-out on a sunny day. There are also plenty of board games to play, books to read and comfy sofas to lounge, chat and make friends. Free WiFi will keep you connected with your social networks. There are plenty of power sockets to charge your phone. There is a large luggage store room so that you can explore the city luggage free on your last day. The hostel is open 24 hours. There is no curfew. No payment for the lockers but bring your own padlock. Smoking is permitted in the garden but alcohol and drugs are not allowed.